Dusk settles and the lights begin to shine in the Piazza III Novembre along the Lake Garda Waterfront in the resort town of Riva del Garda, in the Province of Trento, in the Trentino-Alto Adige region of Italy. Dusk settles along the Lake Garda Waterfront as another day ends and the cafes and restaurants around the Piazza III Novembre prepare for their night-time customers. This old piazza is located in the resort town of Riva del Garda in the Province of Trento, in the Trentino-Alto Adige region of Italy. This piazza dates from sometime in the 13th and 14th century and is surrounded by Medieval architecture. It is the perfect place to explore during the day or to sit and admire the view during the evening when the warm breeze is blowing off the lake and the famous Italian wine is flowing. 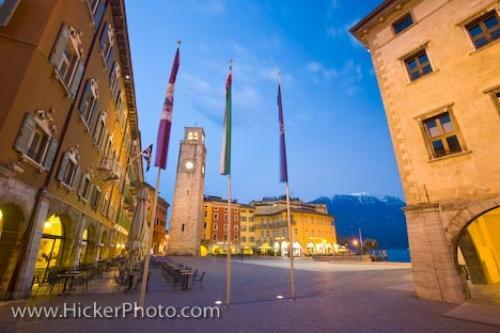 Photo of dusk along the Lake Garda Waterfront in the resort town of Riva del Garda, Trentino-Alto Adige, Italy. ... climbed via its 165 steps if you are feeling up to it! When it was built it was intended as a mechanism for defense for the town as it was tall and could store things like grain that the people could live on if the area was ever attacked. Later it was also used as a prison and then as a watchtower during World War I. In this glorious resort town this Piazza III Novembre situated by the water is the perfect place to spend time relaxing, eating and people watching. Sometimes the best thing someone can do while on vacation is to sit back, eat some local fresh food and admire all the people going by. Dusk along the Lake Garda Waterfront in the resort town of Riva del Garda, Province of Trento, Trentino-Alto Adige, Italy, Europe. I photographed this photo with the digital SLR camera model Canon EOS-1Ds Mark III, aperture of f/8.0, exposure time of 25/1 sec. on ISO 50, as always I used a original Canon Lens, the focus lenght for this picture was 16mm.